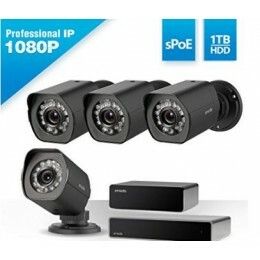 * 1080p Full HD Picture - On-demand live view and video playback gives you a 1080p crystal clear image of home. See in the dark with automatic infrared night vision that illuminates up to 65ft. IP65 weatherproof rating means that you can install cameras anywhere. *Flexible installation - sPoE Repeater fits your flexible installation need. 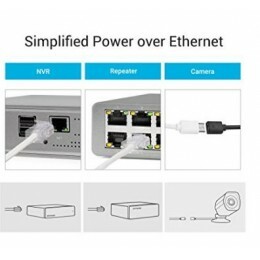 Simplified Power over Ethernet means your cameras connect to the NVR with a single cable that transmits both data and power, allowing for an easier, cleaner, and more flexible installation. 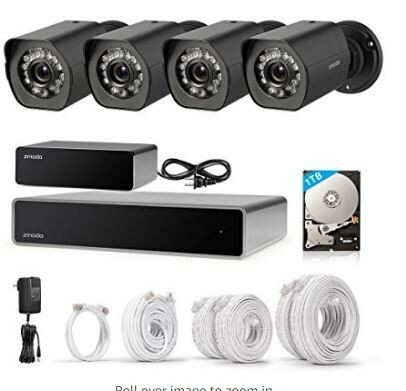 8CH NVR gives you flexible choices to add up to 4 more wired&wireless Zmodo Cameras. *Easy Setup - Easily connect your system by downloading the free Zmodo app for your iOS or Android device, creating a free account, and following the easy in-app instructions to configure your system in minutes. 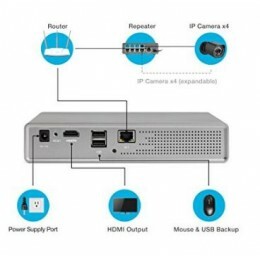 *Maximize your Storage- Intelligent recording on the NVR will optimize your storage space by compressing recorded footage when no motion is detected, and recording at the full 25fps when motion is detected. Record up to 60 days for 4 cameras. *Control Remotely - Keep your property secured, no matter where you are. Control and view your system from anywhere on your smartphone using the free Zmodo app (for iOS and Android devices). Receive motion video clip alerts on your phone when something’s detected at your property. Customize your alert schedules with home/away/sleep modes, motion detection zones, and more to reduce unwanted alerts. Note: Please don't directly plug the power supply into the outlet before connecting it to the NVR.